I honestly don't know where to start with this book. I picked it up the other day at the Book Co-op near my office while I was there indulging in some illicit book junkie shopping, drawn by the title. I was looking for books for my boys, but on reading the blurb, decided initially not to give it to either of them. Having read it, I'm not so sure. Perhaps I will at some point. This is Will Schwalbe's elegy for his mother, Mary Anne Schwalbe, founding director of The Women's Refugee Commission and a respected educator. She was also a passionate reader and with Will, formed a 'book club' of two when diagnosed with pancreatic cancer. They shared a vast and eclectic range of books over the almost two years between diagnosis and her death, reading together and discussing them during the hours of chemo and her increasing frailty. Their activities and discussions were chronicled in part via a blog that she wrote, but in Will's voice, which he uploaded and maintained. The initial thing that drew me to pick it up off the display was 'book club' in the title. There's something about books about books and reading that draws most book junkies to them...this is something Schwalbe talks about, and there are numerous books on the list of books covered in this one that fit that category. I was a little tentative about reading it on an emotional level, because my mother and I shared books in a very similar way. Next year will mark the tenth anniversary of her death, so I'm having all sorts of spooky moments that feel weirdly as if I'm living the year before she died all over again...which is bittersweet, because there were a great many very special things we did in that last year before she died but there was no indication that it was to be the last year we had. We did discuss, that year, collaborating on writing her story. I spent years working on her about this project. Typically, she dismissed her story as being ordinary and unimportant. It wasn't. In her way, she was as much a pioneer as Mary Anne Schwalbe, and the queen of reinventing herself long before Madonna or Kylie Minogue made it an ordinary part of being famous. My mother, unlike Mary Anne Schwalbe, wasn't famous, but in her quiet and stylish way, made a significant impact on so many people. 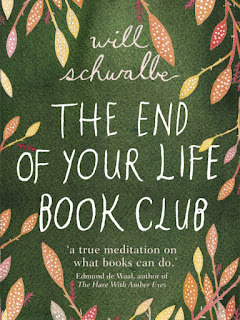 Schwalbe discussed writing this book with his mother - to share what they'd done, and I think, as a means of him putting into print just how important she was to him in a way she discouraged him telling her while she was alive. Her initial response was to tell him that he didn't need to do it, that he was far too busy - he was a publisher, editor, and set up http://www.cookstr.com/, an online recipe library. Later, she came around to the idea and would email him notes and reminders about their discussions, and things she thought he should include. One of the many things I love about bound books is their sheer physicality. Electronic books live out of sight and out of mind. But printed books have body, presence. Sure, sometimes they'll elude you by hiding in improbable places: in a box full of old picture frames, say, or in the laundry basket, wrapped in a sweatshirt. But at other times they'll confront you, and you'll literally stumble over some tomes you hadn't thought about in weeks or years. I often seek electronic books, but they never come after me. They may make me feel, but I can't feel them. They are all soul with no flesh, no texture, and no weight. They can get in your head but can't whack you upside it. That made me laugh - Schwalbe captures absolutely all my feelings about eBooks. He and his mother had numerous conversations about electronic publishing. She never read an eBook. While she understood, as I do, the physical convenience of them, she wanted that physicality of the paper, weight and smell. At the end of the book was one of the most moving passages of all that comes at a point where there is to be no more treatment, it is now just a matter of making what time is left as manageable as possible. They're discussing their latest book. When I looked at Mom in that moment, I saw not a sick person, but not quite the same Mom I'd known all my life. After reading so much together, and after so many hours together in doctor's offices, I felt I'd met a slightly different person, a new person, someone quirkier and funnier. I was going to miss my mother dreadfully but also miss this new person, too - miss getting to know her better. The books, during the period of time the book club exists, become a catalyst for a different kind of relationship between this mother and son.They discuss topics within the context of particular books that they might not have otherwise discussed. Mary Anne was a committed, practicing Christian - Will was uneasy with religion. Yet, during that year, they discuss religion and faith in myriad different ways - which may never have happened without the books. Likewise, other difficult topics - sexuality, family, relationships and, of course, death and dying - all make the book club discussions. Mom taught me not to look away from the worst but to believe that we can all do better. She never wavered in her conviction that books are the most powerful tool in the human arsenal, that reading all kinds of books, in whatever format you choose - electronic (even though that wasn't for her) or printed, or audio - is the grandest entertainment, and also is how you take part in the human conversation. Mom taught me that you can make a difference in the world and that books really do matter: they're how we know what we need to do in life, and how we tell others. Mom also showed me, over the course of two years and dozens of books and hundreds of hours in hospitals, that books can be how we get closer to each other, and stay close, even in the case of a mother and son who were very close to each other begin with, and even after one of them has died. If you do one thing for yourself and others this year, read this book and share it with those you love. 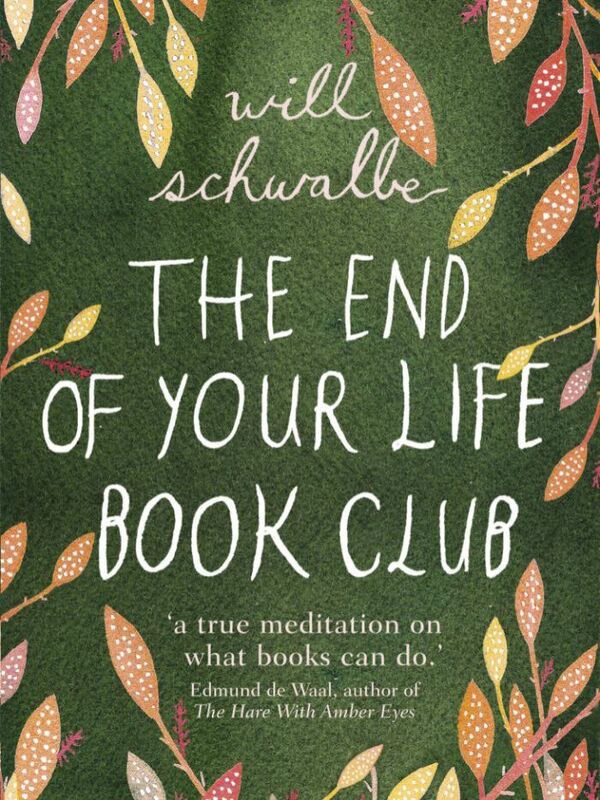 Start your own book clubs. Be part of the ongoing conversation. From this - I will give this book to my boys. I will find a way to write my mother's story by myself. Hello, Kaz! I've been looking for this book for the longest time! I hope they stock it here in Manila soon. Hi Peter! This is a truly beautiful book. I've not been moved so much in a single read for a long time. It was, I think, a very brave book to write - it's not sentimental or mawkish n any way, but the author is painfully honest at times about his sense of his own failings - it's left me with a lot to think about. I hope you can get your hands on a copy soon.